# Peel the eggplant multi colored. Rest them in salty water for about half an hour. # Meanwhile dice the onion into small pieces. Pour the vegetable oil into a pot over the heat. When the oil turns into hot add salt and onion pieces. Fry the onion pieces, until they turn into transparent. # Add peeled and dice tomato pieces into the pot, cover the lid of the pt and cook them until they lose their shape. 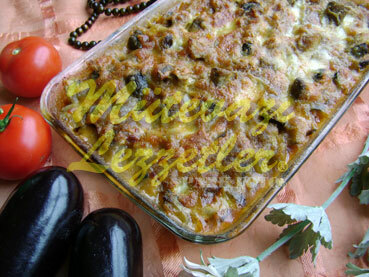 # And then, add black pepper and chopped eggplant pieces in it. Cook the meal over medium heat for about 20 minutes. # After cooling the meal for a while, transfer it into a baking pot. Sprinkle bread crumbs all over the meal at first, then sprinkle kasar cheese. # Bake the meal until it turns into red in the oven which is preheated to 374 F.
Note: Bread crumbs are added to make the meal crispy. If you do not have at home, it is not a must.